This list of Macintosh models grouped by CPU type contains all CPUs used by Apple Inc. for their Macintosh computers. It is grouped by processor family, processor model, and then chronologically by Macintosh model. The Motorola 68000 was the first Apple Macintosh processor. It had 32-bit CPU registers, a 24-bit address bus, and a 16-bit data path; Motorola referred to it as a "16–/32-bit microprocessor." The Motorola 68020 was the first 32-bit Mac processor, first used on the Macintosh II. The 68020 had many improvements over the 68000, including an instruction cache, and was the first Mac processor to support a memory management unit, the Motorola 68851. The Macintosh LC configured the 68020 to use a 16-bit system bus with ASICs that limited RAM to 10 MB (as opposed to the 32-bit limit of 4 GB). The Motorola 68030 was the first Mac processor with an integrated memory management unit, allowing for virtual memory. Another improvement over the 68020 was the addition of a data cache. The Motorola 68040 had improved per-clock performance compared to the 68030, as well as larger instruction and data caches, and was the first Mac processor with an integrated floating-point unit. The MC68LC040 version was less expensive because it omitted the floating-point unit. 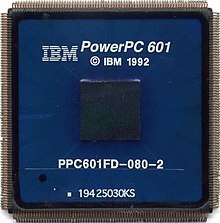 The PowerPC 601 was the first Mac processor to support the 32-bit PowerPC instruction set architecture. The PowerPC 604e was the first Mac processor available in a symmetric multiprocessing (SMP) configuration. The PowerPC 7400 was the first Mac processor to include an AltiVec vector processing unit. 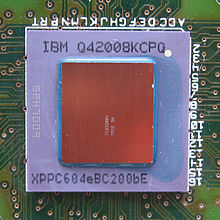 The PowerPC 7455 was the first Mac processor over 1 GHz. The PowerPC 970 was the first 64-bit Mac processor. The PowerPC 970MP was the first dual-core Mac processor and the first to be found in a quad-core configuration. It was also the first Mac processor with partitioning and virtualization capabilities. Yonah was the first Mac processor to support the IA-32 instruction set architecture, in addition to the MMX, SSE, SSE2, and SSE3 extension instruction sets. The Core Solo was a Core Duo with one of the two cores disabled. Woodcrest added support for the SSSE3 instruction set. Merom was the first Mac processor to support the x86-64 instruction set, as well as the first 64-bit processor to appear in a Mac notebook. Clovertown was the first quad-core Mac processor and the first to be found in an 8-core configuration. Penryn added support for a subset for SSE4 (SSE4.1). Integrated memory controllers (with on-die DMI or QPI). Simultaneous multithreading (branded as Hyper-threading). Full support for the SSE4 instruction set (SSE4.2). Support for Intel Turbo Boost. 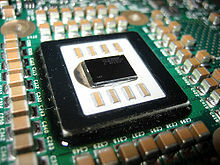 Four cores on a single die rather than a multi-chip module of two dual-core dies. Arrandale introduced Intel HD Graphics, an on-die integrated GPU. Sandy Bridge added support for Intel Quick Sync Video, a dedicated on-die video encoding and decoding core. It was also the first quad-core processor to appear in a Mac notebook. The Crystal Well variant used in some MacBook Pros contains an on-package L4 cache shared between the CPU and integrated graphics. Coffee Lake was the first 6-core processor to appear in a Mac notebook. ^ a b Included due to its compatibility with Macintosh software and common use as an early Macintosh development platform. ^ Retroactively named the "Macintosh 128K" after the release of the Macintosh 512K. ^ An Apple Lisa modified with MacWorks XL to run Mac software. ^ Sold in educational markets as the "Macintosh Plus ED." ^ Sold in educational markets as the "Macintosh ED." ^ Shipped with A/UX operating system but capable of running Mac OS. ^ Sold in Europe and Asia as the "Power Macintosh 6300/160." ^ a b Shipped with AIX operating system and incapable of running Mac OS. ^ Ran a modified version of Mac OS X with the Front Row user interface. 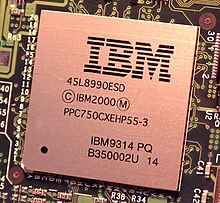 ^ a b Uses an ultra low-voltage processor previously branded as Core M.
Ian Page and contributors, MacTracker. Glen Sanford, Apple History, apple-history.com. Dan Knight, Computer Profiles, LowEndMac, Cobweb Publishing, Inc. This page was last edited on 27 July 2018, at 15:42 (UTC).